“Church renewal is coming primarily through an emphasis on collegiality and the restoration of the synodal process to what it was intended to be in Vatican II" - Austen Ivereigh. 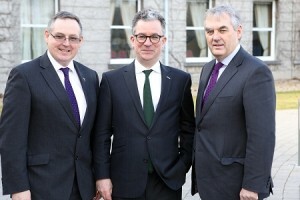 Dr Austen Ivereigh, with Professor Eamonn Conway, Head of Theology and Religious Studies at MIC (l) and Professor Michael A Hayes, President of MIC (r). Pope Francis’s pontificate has set out to unblock the channels of the Holy Spirit so that the Church can be renewed according to his biographer. Almost two hundred people attended a public lecture by Pope Francis expert, Dr Austen Ivereigh, at Mary Immaculate College recently. Dr Ivereigh is the author of the bestseller ‘The Great Reformer; Francis and the Making of a Radical Pope’. He stressed to his listeners that Pope Francis is putting a great emphasis on protecting and promoting the family because for him the family is the means by which the Spirit flows in to the world. “Church renewal is coming primarily through an emphasis on collegiality and the restoration of the synodal process to what it was intended to be in Vatican II. For Francis, the Church is not an end in itself: it is at the service of Christ,” he said. According to Dr Ivereigh, he began to deeply admire Pope Francis during his research for the book, ‘The Great Reformer; Francis and the Making of a Radical Pope’, in particular for his great courage. “I think that direct spontaneous speech is part of a larger reform of the Church and of the papacy which he is carrying out and he perceives it is very important to have that direct contact with people. He doesn’t want to be filtered”. “Secondly, he causes offence, but that to me is part of his authenticity. He is not setting out to please people, unlike politicians. Only a pope could get away with calling Europe an ‘infertile grandmother’. He is quite happy to use those kind of metaphors which people in public life don’t normally do,” Dr Ivereigh added. The London-based journalist, author, commentator and campaigner is a former deputy editor of The Tablet and later Director for Public Affairs of the former Archbishop of Westminster, Cardinal Cormac Murphy-O’Connor. He is frequently invited to appear on radio and TV programmes to comment on stories involving the Church. As the founder of Catholic Voice in the UK and with a PhD from Oxford on Church-State relations in Argentina, his grasp of where Pope Francis has come from, and where he is leading the Church is hard to equal, according to Professor Eamonn Conway, Head of Theology & Religious Studies at MIC. ‘The Great Reformer; Francis and the Making of a Radical Pope’ was published in December 2014, and is recognised as being the most comprehensive and insightful biography to date the Argentine pontiff. His lecture in Limerick was co-sponsored by the Department of Theology & Religious Studies (TRS) MIC, the Irish Section of the European Society for Catholic Theology, and the Irish Catholic Newspaper and was chaired by Professor Eamon Conway, Head of TRS, Mary Immaculate College.